Discussion in 'Case Central' started by d_brennen, Apr 8, 2019. Looking to build a SFF around the AM4 platform and looking for a decent case. The PC would be on my left hand side, for reasons, so I'd like the window side to be the right hand panel. This would obviously mean inverted MB and also means the GPU shroud would be visible, which is nice. I've seen ATX cases like this but not ITX. I'd consider mATX too if the size won't be too much bigger. Main drawback against your spec would be the window; it's small. But fitting a full-size one is a common mod for this case, and not the toughest DIY job really. There's also a Chinese knock-off version that already has a full side window. Not easy to order outside of China though. Slightly over your budget, but ITX. Inverted motherboard tray. Supports full size GPU's. Full aluminum. Main drawback against your spec would be the window; it's small. But fitting a full-size one is a common mod for this case, and not the toughest DIY job really. Will check out modding posts for it, really wanted an off the shelf solution though. Raijintek Ophion? (although you wouldn't see the GPU - sandwich design). Yeah, I saw that alright. I believe there were plans to include extension tubes that would hold the glass panels an extra 5-10mm away from the case, but sounds like an afterthought rather than a proper solution. 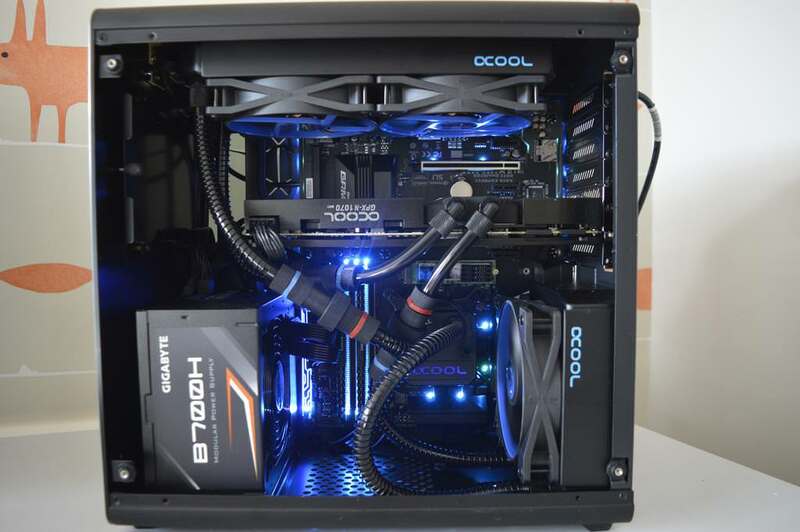 The Evo version has extra room up top for a beefier AIO, but you still have your GPU problem. There's the Streacom DA2 as well, which I like the look of, but it still isn't perfect for you; you'd have to mod the window in yourself, and it's already over budget. Don't think you could use an AIO in it without blocking the "view" either. With the raised pieces on the top and bottom, it's actually not the smallest case. I love my Raijintek Thetis, but it's probably bigger than you want. I have a full ATX builld in mine. 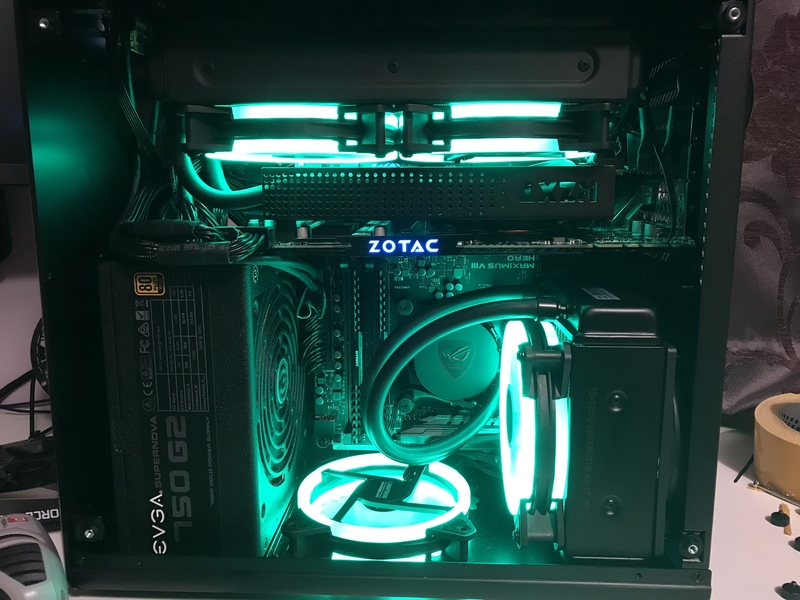 Yeah I really like it, I had some issues with temperatures initially, but I've put everything under AIO's to sort that and now I'm super happy with it. 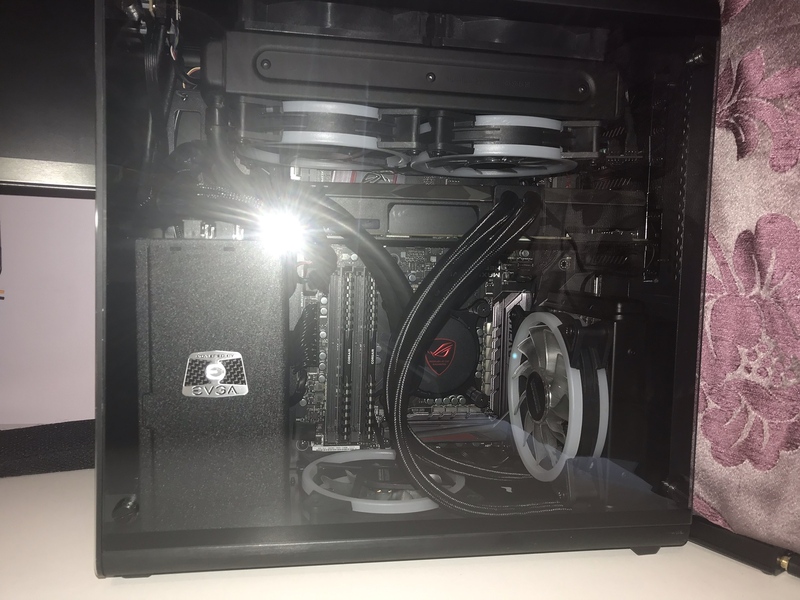 It does have a weird layout and I had literally the biggest GPU and PSU it's physically possible to fit in the case, so it's tight but JUST fits, fortunately! You will not fit a GPU this large with a PSU any longer than mine.